The first question people ask me about my bicycle route and schedule for my 22,000-mile tour is, "Omg, you poor thing. How do you ride through the winter?" Well, I meticulously plan my route to time the seasons, enjoying optimal weather year around. So don't feel too bad for me, especially right now. No really, don't feel bad for me. But it's not to say that I haven't encountered my fair share of brutal weather. During my previous 11,000-mile bicycle tour, I had to bicycle through freezing rain in West Texas and I hibernated during 8-inches of snowfall in New Mexico. When I was bicycling through West Texas, I would have to stop every mile to return feeling to my hands and feet. As I was riding down the deserted highway through West Texas, I layered my hands with as many leather work gloves as I could find on the side of the road. At one time I had five pairs of mix-matched cow-hide gloves, with two left handed gloves on my right hand. I couldn't do much for my feet though. Number 1- Shaving. Contrary to popular belief, facial hair does not keep your face warm. Well, at least not mine. I'm sure your face would stay warm if you have a massive 'Grizzly Adams' beard. But I can't grow one. So I was much better off clean shaven then with a 5 o'clock shadow. It works so well, in fact, I tested the theory on my legs and yes, not only does it feel awesome under the sheets, but also eliminates the wind chill factor. Number 2- Letters. And not the ABC's, but actual penpal letters sent to me from kids around the country! Not even my grandma's chicken noodle soup can warm my insides like a letter from a school or class I have previously visited. I mean, YOU try reading this letter without tingling inside. I am often asked how I am able to continually ride thousands of miles, month after month. With moments like this, how could I stop?? $20 if you can figure out what's on the back of my bicycle. A carrot?? And number 3- Crusty old men. Meet Boston Bill. No really, click here to read about his truly touching story; I can not, and will not attempt to, do it justice. In 2007, Boston Bill became an amputee after an infection spread through his foot. After his quick recovery, and determination not to let it get in between his lifelong passion for running, he became an inspiration to the amputee patients he visited, and all those he encounters. It is because of people like Boston Bill, and the incredible inspiration and perspective they grant me, that I am able to endure all. 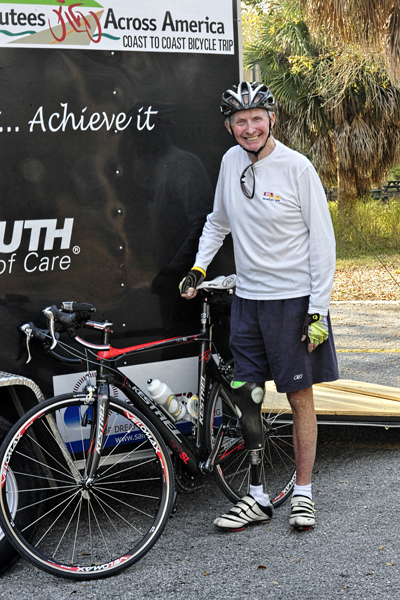 After becoming an amputee at age 70, Boston Bill rides his bike cross-country to inspire. 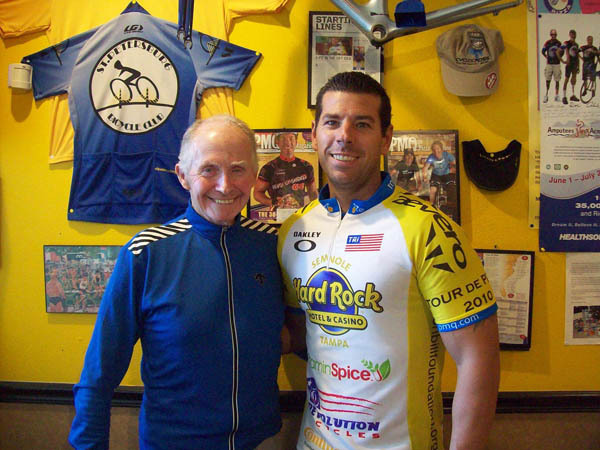 I was sitting inside Tour de Pizza, local cycling-themed pizza shop in St. Petersburg, FL and home of the 30 day pizza diet, when Boston Bill pulled open the glass door to walked in. I had met Boston Bill by chance on my first tour for all of 10 minutes, in front of a coffee shop while departing St. Pete, and his warm and generous spirit stayed with me for 15,000 miles. He walked in proud and confident, wearing a gray crew neck sweatshirt and a generic 5k/10k benefit run baseball cap. Boston Bill strutted the 7-feet from the front door to the cash register, with such humility, that I couldn't help but smile. I immediately jumped from the pizza bar, displaying 10 different pizzas in a uniformed line, to greet him at the cash register with dim hopes that he would remember who I was. Well, if he didn't remember me, he did a tremendous job of acting like he did. A beaming, almost presidential-like, smile, a hand shake and a 'How the heck are ya?!" But I am sure that this is how he treats anyone he meets, strangers and friends alike. He immediately invited me to sit with him as he enjoyed his usual slice of cheese pizza. We shared stories from the road, and the hospitality of people for, an hour without pause or change of subject. It was like we were long lost friends with a lifetime of catching up to do. We parted with a warm and genuine hug, his right cheek pressed firmly against mine, as I whispered my gratitude towards him. We often get overwhelmed from the very thought of the long, cold road we must take towards our goal or dream, even before taking the first step. We talk ourselves out of even beginning the journey by over-thinking about the struggle, and all that could go wrong in pursuit of our dream. The reason we do, is because we feel like we have to go down this road by ourselves. I would be the biggest fool in the world if I told you that I completed my first tour by myself. Although I was physically by myself, I encounter thousands a people, that seemed to be placed on my path at precisely the right time, with a purpose; to help further me along my own path. Whether it was money, a place to stay, a pat on the back, or a simple smile, every single person I met helped me, in some way, motivating me to continue one more day. The next day, I would meet someone else. And the next day, and the next day. If I would have gone one day with out meeting an incredible soul, I am certain that I would have quit. We are not alone. Once you set down the road towards your dream, you will meet people that are placed on your path, with the sole purpose of helping you get one step closer to your dream; just long enough until you meet the next person. But nobody will or can help you take that first step. That one you'll have to do by yourself. Something tells me you can handle it though. And when your road becomes so cold that you don't feel like you can continue, just shave, read a letter a kid wrote you, and talk with a crusty old man. Thank you Matt McClellan and Tour de Pizza for sponsoring the St. Petersburg/Tampa, FL tour stop! And thank you Boston Bill for your tremendous strength and uplifting presence. You are no longer crusty, and you will never be old for as long as you inspire. I am very proud to know you. You may help others obtain a prosthetic leg by donating to the Boston Bill Foundation. Please forward this message to family and friends to help me reach as many as possible with my message. Follow my 22,000-mile bicycle tour to raise awareness for childhood obesity with daily updates on Facebook and Twitter.